PHMSA provides grant opportunities designed to improve damage prevention, develop new technologies, or otherwise improve pipeline safety. You can subscribe to receive notifications for grant opportunities. PHMSA highly recommends reading the solicitation thoroughly to understand the types of activities that are eligible for funding, how to apply, and who to contact for support. Pipeline safety base grants are authorized by Title 49 of the United States Code (49 U.S.C.) Chapter 601 §60107 – State Pipeline Safety Grants. To qualify for federal grant funds a state agency must participate in the pipeline safety program either under certification in accordance with 49 U.S.C. §60105 or under an agreement in accordance with §60106. The scope of the grant is to support up to 80 percent of the cost of personnel, equipment and activities reasonably required to carry out inspection and enforcement activities of intrastate pipeline facilities under a certification or agreement with the Secretary of Transportation or to act as an agent of the Secretary with respect to interstate pipeline facilities. The activities covered are those specifically for the inspection of natural gas or hazardous liquid pipeline facilities to ensure compliance and enforcement as necessary of applicable chapters of Title 49 of the U. S. Code of Federal Regulations (CFR). The states inspect approximately 90 percent of the pipeline infrastructure under federal safety authority. A listing of federal awards to state pipeline safety programs are at the following links: CY2008, CY2009, CY2010, CY2011, CY2012, 2013, 2014, 2015, 2016, and 2017. Questions regarding the Pipeline Safety Base Grants should be directed to Zach Barrett at zach.barrett@dot.gov. PHMSA’s Technical Assistance Grants (TAG) program offers opportunities to strengthen the depth and quality of public participation in pipeline safety matters. TAG program awards enable communities and groups of individuals to obtain funding for technical assistance in the form of engineering or other scientific analysis of pipeline safety issues and help promote public participation in official proceedings. For purposes of grants eligibility, communities are defined as cities, towns, villages, counties, parishes, townships, and similar governmental subdivisions, or consortia of such subdivisions. A nongovernmental group of individuals is eligible for a grant under the TAG program if its members are affected or potentially affected individuals who are incorporated as a non-profit organization in the state where they are located. PHMSA is accepting applications for the FY 2019 Technical Assistance Grants. The Notice of Funding Opportunity. (NOFO) is available on Grants.gov. Complete applications must be received electronically through Grants.gov by 11:59 pm Eastern Time on May 3, 2019. PHMSA first awarded TAG funding for projects beginning in 2009. Follow this link for past TAG projects. If you have any questions or concerns about PHMSA’s TAG Program, please contact Karen Lynch by email at Karen.Lynch@dot.gov, or by phone at 202-366-6855. PHMSA is authorized to award grants to fund improvements in state damage prevention programs. Section 2 of the PIPES Act added a State Damage Prevention Grant Program to the Federal Pipeline Safety Law as 49 USC §60134. Any state authority (or municipality with respect to intrastate gas transportation) that is or will be responsible for preventing damage to underground pipeline facilities is eligible as long as 1) the state participates in the oversight of pipeline transportation pursuant to an annual 49 U.S.C. §60105 certification or 49 U.S.C. §60106 agreement in effect with the Pipeline and Hazardous Materials Safety Administration, and 2) is designated by the state’s governor, in writing, as the eligible recipient of the grant funding. However, to qualify for a grant under 49 U.S.C. §60106, a State one-call notification program may not exempt municipalities, State agencies, or their contractors from the one-call notification system requirements of the program. Participation by operators, excavators, and other stakeholders in the development and implementation of methods for establishing and maintaining effective communications between stakeholders from receipt of an excavation notification until successful completion of the excavation, as appropriate. A process for fostering and ensuring the support and partnership of stakeholders, including excavators, operators, locators, designers, and local government in all phases of the program. A process for reviewing the adequacy of a pipeline operator’s internal performance measures regarding persons performing locating services and quality assurance programs. Participation by operators, excavators, and other stakeholders in the development and implementation of effective employee training programs to ensure that operators, the one-call center, the enforcing agency, and the excavators have partnered to design and implement training for the employees of operators, excavators, and locators. A process for fostering and ensuring active participation by all stakeholders in public education for damage prevention activities. A process for resolving disputes that defines the State authority’s role as a partner and facilitator to resolve issues. Enforcement of State damage prevention laws and regulations for all aspects of the damage prevention process, including public education, and the use of civil penalties for violations assessable by the appropriate State authority. A process for fostering and promoting the use, by all appropriate stakeholders, of improving technologies that may enhance communications, underground pipeline locating capability, and gathering and analyzing information about the accuracy and effectiveness of locating programs. A process for review and analysis of the effectiveness of each program element, including a means for implementing improvements identified by such program reviews. Follow this link for information on the state damage prevention grant projects or contact Hung Nguyen at Hung.Nguyen@dot.gov. PHMSA is accepting applications for the FY 2019 State Damage Prevention Grants. The Notice of Funding Opportunity (NOFO) is available on Grants.gov. Complete applications must be received electronically through Grants.gov by 11:59 pm Eastern Time on May 1, 2019. PHMSA’s One Call Grant Program is designed to provide funding to state agencies in promoting damage prevention, including changes with their state underground damage prevention laws, related compliance activities, training and public education. This grant program is for states that have a certification or agreement with PHMSA to do pipeline safety inspections. State agencies that participate in the pipeline safety program are eligible to apply for one-call grant funding on an annual basis, with a maximum request amount of $45,000 per state. 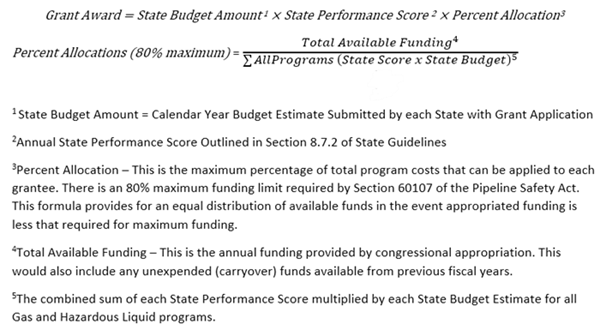 See the One Call Grant Funding Criteria. Compliance - compliance monitoring and enforcement, legal assistance with enforcement actions, development of compliance statistics, procurement of computers and other equipment to support ongoing enforcement programs. Performance - development of one-call center statistics, one-call membership initiatives, procurement of one-call center computers and other equipment. Communication and training - communication improvements, development and/or conduct of state-provided training programs, development and/or distribution of promotional items or materials, informational mailings, and advertisements, damage prevention awareness campaigns, and public service announcements. PHMSA, working with the National Association of Pipeline Safety Representatives (NAPSR), released a report in February 2010, "2009 One Call Report Analysis & Recommendations" that concluded "an increased funding level is needed…to provide the needed assistance to states". Listings of one-call grant awards for 2010, 2011, 2012, 2013, 2014, 2015, 2016, and 2017	are available. More information is available under the Catalog of Federal Domestic Assistance. Questions regarding one-call grants should be directed to Zach Barrett at zach.barrett@dot.gov. PHMSA is accepting applications for the FY 2019 One-Call Grants. The Notice of Funding Opportunity (NOFO) is available on Grants.gov. Complete applications must be received electronically through Grants.gov by 11:59 pm Eastern Time on May 1, 2019. The Gas Technology Institute for "Networked RFID Technology for Monitoring Pipelines" in the amount of $215,133.00. The end date was 3/31/2011. Rutgers University for “Incorporating GPS Technology to Enhance One-Call Damage Prevention in New Jersey” in the amount of $200,000.00. The end date was 5/1/2011. The Final Reports were completed in 2011 and are available via the links above. Questions regarding the TDG Program should be directed to Amy Nelson at amy.nelson@dot.gov. Underground natural gas storage grants are authorized by Title 49 of the United States Code (49 U.S.C.) Chapter 601 §60107 – State Pipeline Safety Grants and §60141 – Standards for underground natural gas storage facilities. To qualify for federal grant funds a state agency must participate in the underground natural gas storage safety program either under certification in accordance with 49 U.S.C. §60105 or under an agreement in accordance with §60106. The scope of the grant is to support up to 80 percent of the cost of personnel, equipment and activities reasonably required to carry out inspection and enforcement activities of intrastate underground natural gas storage facilities under a certification or agreement with the Secretary of Transportation or to act as an agent of the Secretary with respect to interstate underground natural gas storage facilities. The activities covered are those specifically for the inspection of underground natural gas storage facilities to ensure compliance and enforcement as necessary of applicable chapters of Title 49 of the U. S. Code of Federal Regulations (CFR). 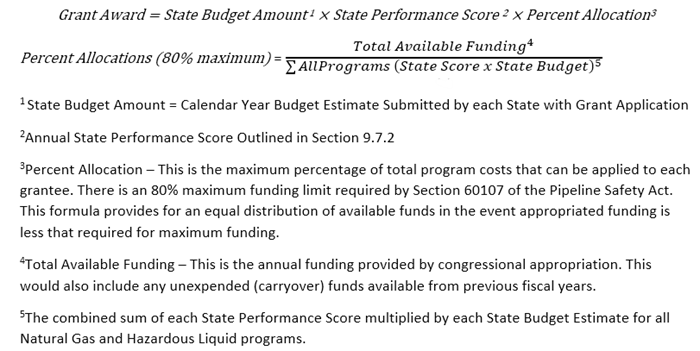 The state agency assumes responsibility for the administration of the grant program through the application of sound management practices assuring program funds have been expended and accounted for in accordance with program objectives, the payment agreement, specific guidelines, 2 CFR 225 (Office of Management and Budget Circular A-87) and any other applicable federal rules and regulations. Listings of federal awards to state underground natural gas storage safety programs for CY2018 are available. Questions regarding the Underground natural gas storage grants should be directed to Zach Barrett at zach.barrett@dot.gov.